The half marathon would be my favorite distance. I’m always thinking of how many miles I have left, and with a half, you just go as fast as you can and hang on. My body was built for the half and breaks down to much in the full. Consistency, I struggle with hamstring issues that often keep me from training consistently. If my hamstrings are feeling strong, I can load on the speed and miles. But the second they hurt, I get all out of whack and nothing feels good. This makes it hard to progress. I try to. New Balance Vongo’s are my everyday shoes. My race/speed shoes are the Adidas Boston’s or something on that line. I don’t have a definite mantra, but I am training my mind to be positive and to not let any negative thoughts in. I’m sticking with each mile and not thinking ahead. I’m also trying to tell myself that “I can stay with the fast people”. I struggle with negative thoughts of not being able to do the speed or miles that others do. Deena Kastor wrote an amazing and motivational book (Let Your Mind Run) about this topic. Haha, very often. I first try to tell myself, that the work you put in will help it get easier along the way. I also listen to running podcasts that interview elite runners for motivation. I make myself run until the podcast is over. Also, a new outfit or shoes really goes a long way! So many things! Friends, my fiancé-Brian, confidence, health, seeing the country. They all have different meanings. #1-Big Sur – for it’s beauty. #2-LA marathon- for its laughter and friendship(Wendy & Kristina can agree), and #3 – Indy Mini because I just loved that race and grew up watching Indy car races. I was a hurdler in my early high school years, but a lot of my friends were distance runners. They would invite me to run laps with them after my hurdle drills. They asked me to join the cross country team my junior year of high school. The rest is history. Lets just say, I probably would rip a hamstring if I tried jumping a hurdle today! Yasso 800’s or mile repeats. Emma Coburn for her athleticism and Desi Linden for her “just do it” mentality. 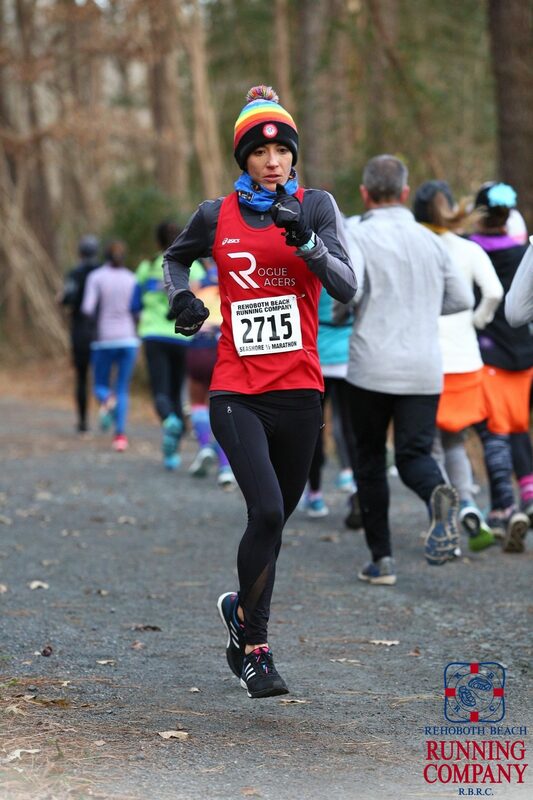 I once ran a trail race in December. I had no clue what I was in for. I figured it would be like running High Banks with snow. They made me run thru freezing water up to my calves. I thought it was insane. My feet were frozen and my hamstrings were on fire. I ended up getting 2nd place only because I just wanted it to end. London marathon will always be my #1 bucket list. I have family in England and just love that country. I have tried several times and keep getting denied. Someday I will run the London marathon. New York City would be my 2nd Bucket list race. I usually do not listen to music. I like silence after a long day at work. A running podcast would be the only thing I might listen to.